Entries Close This Week – Enter NOW! 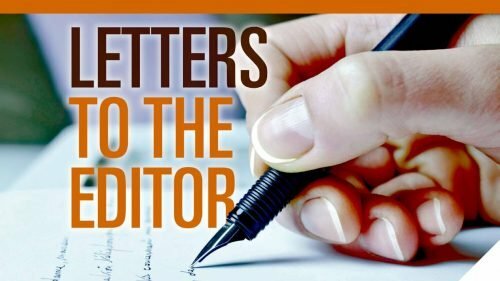 $1,000 Cash Plus Fab Prizes to Win! Great prizes including $1,000 cash prizemoney can be won in this year’s TWT Gladesville Christmas Festival Teen Queen Quest. 2015 TWT Teen Queen will officially open the Gladesville Christmas Festival on Saturday December 5 at Gladesville Shopping Village and star at special events through the year of her reign. She will also be presented on stage at the TWT Rotary Community Christmas Carols Spectacular at North Ryde Common on Sunday December 20 and at the Hunters Hill Carols by Candlelight at Boronia Park. The winner will be following in the footsteps of some well-known and popular former TWT Gladesville Teen Queens including the Yellow Wiggle Emma Watkins who was TWT Gladesville Teen Queen in 2004 and TWT 2009 Granny Smith Festival Queen. Competition is open to all teenage young ladies aged from 13 to 19 on December 5 this year and entry is free. 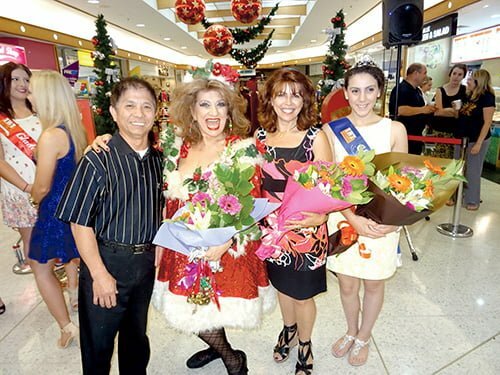 PICTURED right: Reigning 2014 TWT Gladesville Festival Teen Queen Samantha Bowyer-Tagg was crowned by her predecessor 2013 TWT Festival Teen Queen Johanna Sciancalepore in Gladesville Shopping Village centre court. TWT on-the-spot PHOTO. BUT HURRY: ENTRIES CLOSE THIS WEEK IN NEXT FEW DAYS. $1,000 in cash prizemoney can also be won this year in our TWT Gladesville Christmas Festival Singing Star Contest sponsored by Gladesville Shopping Village. The contest is launched this week and candidates are invited to enter in two age divisions: 14 years and under and 15 years and over. Heats and finals will both be held on Gladesville Christmas Festival Day Saturday December 5 at Gladesville Shopping Village starting at 10.30am. 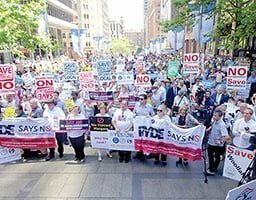 The winners will be invited to perform on stage at the TWT Rotary Community Christmas Carols Spectacular at North Ryde Common on Sunday December 20. Competition is conducted by Ryde Citizen of the Year and Ryde Woman of the Year Roseanna Gallo OAM of RG Music. Contestants are invited to complete the coupon on this page or email direct with details and preferred audition times to: [email protected] and entrants are advised to apply as soon as possible because numbers will be limited this year to conduct the heats and finals on the same day. 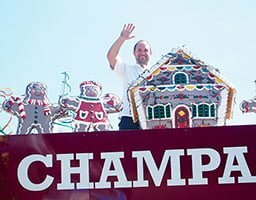 Santa Claus in coming back to Gladesville Shopping Village for the Gladesville Christmas Festival celebrations. He will arrive on Monday December 14 and be seated on his throne in centre court for photos with children up till Christmas time. 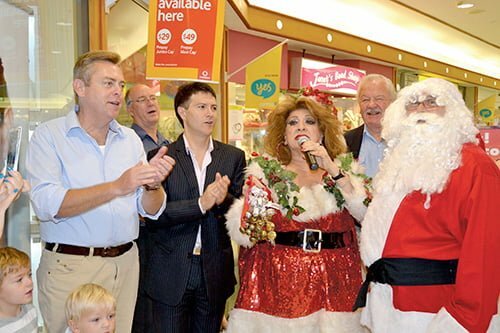 Santa is pictured with Mama Claus (Maria Venuti AM) who lead the singing of Jingle Bells at last year’s celebration with Lane Cove MP Anthony Roberts, Ryde MP Victor Dominello, Able’s Betta electrical’s Alan Cain and Hunters Hill Councillor Peter Astridge. TWT on-the-spot PHOTO. 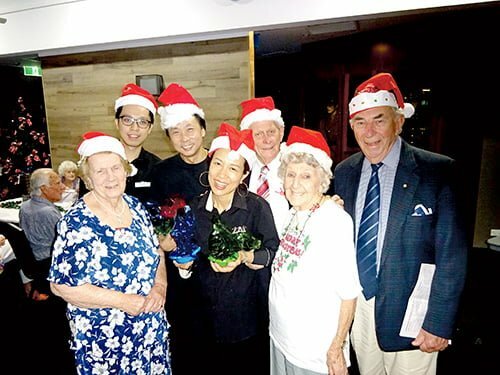 Gladesville Ryde and Hunters Hill Branch of Combined Pensioners and Superannuants Association celebrated their annual Christmas Luncheon on Monday at Gladesville RSL Community Club in the newly refurbished auditorium. Pictured with the new catering staff members are President Ron Gee, Secretary Merle Parnaby, Doreen Rickards and Patron Jim Hull OAM. TWT on-the-spot PHOTO.